ANCEL FX6000 OBD2 Scanner is a professional automotive diagnostic tool / ECU Programmer / Key Programmer. You won’t spend an arm and leg for it. Despite that fact, it offers a host of basic and advanced diagnostic features. You will find that the Ancel FX6000 is not a perfect scan tool but it is ideal to a particular demographic. It is especially excellent for pulling and clearing codes. With it, you can read and erase codes for the engine, transmission, SRS and ABS systems. At least that is what its makers (Ancel) claim. But is it true? Does it actually support all the functions you need for basic and advanced diagnostics? And who is it suitable for? Read on for answers to those and more questions that might be bugging your mind. This review is based entirely on my experiences after purchasing and using the Ancel FX6000. 3 Who Is ANCEL FX6000 Built For? The scanner comes in a well-packaged carrying case. It is tucked nicely inside the case; which by the way you can use to carry the device and all its components. Speaking of components, the box also contains a diagnostic cable, an OBD2 connector, a CITROEN-16C connector, a USB cable, and a user manual. 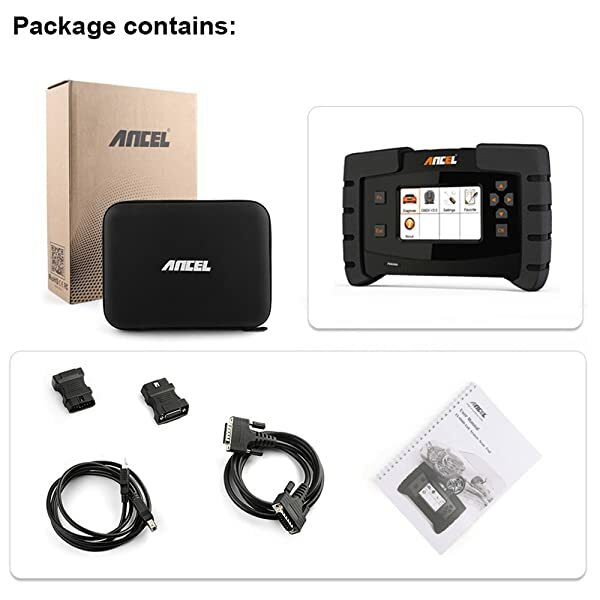 ANCEL FX6000 comes in a well-packaged carrying case. That is the complete package, you won’t need to buy anything else. When you take the scanner out of the box the first thing you will notice is its compact size. It looks and feels like a smartphone, it can fit into anyone’s hand comfortably. The weight is just about 4 pounds. With that size, it would be accurate to say that the Ancel FX6000 is one very portable diagnostic tool. If you are a mechanic whose work involves moving around, then carrying this device won’t be an issue. The same goes for car owners or DIY enthusiasts who need a scanner that can fit in a toolbox or the driver’s compartment. Another noticeable thing is the interface. There are only 7 buttons. There’s the OK’ button for selecting an item, the Esc’ button for exiting and four navigation buttons. Those are 6. Now the seventh button is the FN’ key. You can use this particular key to customize your menus. It helps when you need to customize shortcuts to favorite functions that you use frequently. At the center of the scanner is a large-enough TFT display. When it is on, the screen shows items with crisp clarity. You would think you are using a smartphone. Ancel FX6000 is quite a comprehensive scanner. It is made to cover all OBD-2 vehicles, both gasoline, and diesel. Just in case you are not aware, OBD-2 vehicles are all 1996 and newer models. Having said that, the Ancel FX6000 only works on vehicles that use no more than 12V of power. And if it is compatible with your vehicle there’s every possibility that it will support all 10 OBD2 protocols. That is amazing and all, but even more impressive is the fact that this scan tool can diagnose vehicles that were manufactured as early as 1992. It is primarily an OBD2 scanner but you can purchase an OBD1 cable and use it on 1992 to 1995 vehicles. You won’t find many scanners in the Ancel FX6000’s price range that support OBD1 and OBD2 diagnostics. So as far as compatibility, this one is beyond impressive. Also, the package includes 13 OBD connectors for different car makes. It doesn’t work on all vehicles, including some that are OBD2-compliant. In some cases it fails to connect with the car’s computers, it only displays an error message. A few of the vehicles where you might run into this problem are the 2002 Honda Accord, 2003 Ford F250, 2000 BMW 750il, and Chrysler PT Cruiser. Preparing the Ancel FX6000 for use is a breeze. You only need to update its firmware and you will be good to go. If you fail to do so you may encounter functional and compatibility issues when using the scanner. The Ancel FX6000 is obviously a very reliable scanner. The good news is that the upgrade process is a straightforward one. Simply visit Ancel’s website, open an account and register your scanner using its serial number. Once that’s done you can proceed to download the latest software update. Make sure the scanner is connected to your PC as you do all that. The package contains a USB cable for PC connections. Also, make sure you list all the vehicles that you want to test when prompted to specify the vehicles you need the scanner to cover. The whole setup procedure is simple. You only need a PC and internet connection and you will be set. In the unfortunate event that the update process fails simply disconnect the scanner, reconnect it and then try again. If you don’t have access to a Windows PC you are out of luck. The Ancel FX6000 doesn’t update on Mac systems. This scanner can check just about any onboard system. It is especially excellent for pulling and clearing codes. With it, you can read and erase codes for the engine, transmission, SRS and ABS systems. Other systems that the Ancel FX6000 checks include the SAS, audio systems, air conditioning, DPF, ACC, doors, and windows. This diagnostic tool can also work as a key programmer, ECU Programmer / Coder. In short, this is as good as mid-range scanners come. The FX6000 takes just about 20 seconds to pull codes and under 2 minutes to clear them. For its price, you won’t find a faster scan tool. For ease of use, it has a built-in library that contains code definitions (for generic codes). Additionally, it comes with a booklet that contains a fairly comprehensive guide on OBD2 diagnostics. All that information makes it easy to use, even for newbies. I already mentioned that the Ancel FX6000 has compatibility issues with some vehicles. In others, it connects to the car’s computers all right but fails to check some systems. For instance, it could not pull engine codes on a BMW 135. Neither could it read or erase ABS codes on a 2006 Jeep Liberty and SRS codes on a Honda Odyssey. Another issue is that the scanner doesn’t save codes. You cannot recover them once they are erased. In addition to checking codes, you can use the Ancel FX6000 for smog tests. It supports I/M readiness and O2 sensor tests. Those are two tests that will keep your mind from worrying about emission checks. To most car owners, a scanner’s ability to read codes and do smog tests is what matters. Nobody fancies visiting Autozone or any other auto shop just to do emission checks. Luckily the FX6000 saves you from that. Not much to complain here. This device is actually excellent at doing smog tests. Besides codes and emissions, the Ancel FX6000 supports several advanced diagnostic functions. 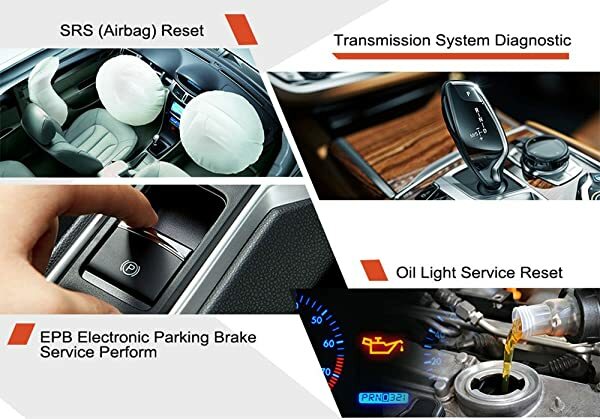 For starters, it can perform ECU programming and coding. 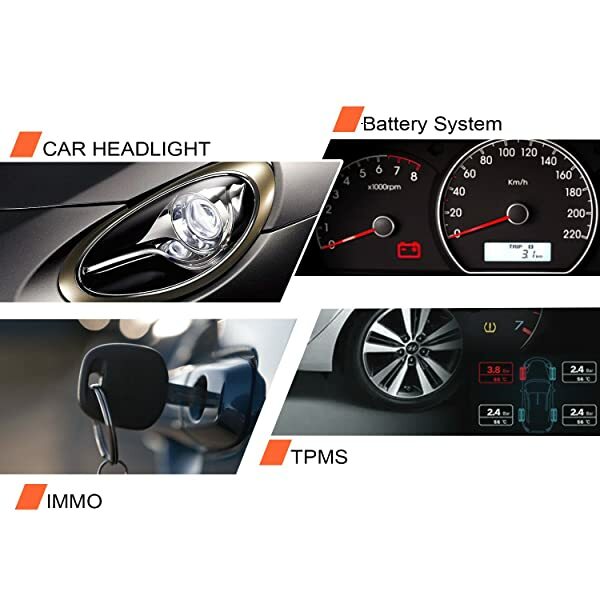 Additionally, the scanner can diagnose your vehicle’s powertrain, body system, chassis, SAS, DPF and TPMS sensors. It also resets EPB oil service. ANCEL FX6000 is a full system scan tool. This scanner is much more than a code reader. The advanced functions can tell you a lot about your vehicle’s systems. It basically offers the same functions that high-end scanners do. And you get to view the diagnostic data in a text as well as graphical formats. Advanced functions don’t work on all vehicles. The issue of selective compatibility is a persistent one. You may want to inquire from Ancel if your vehicle is fully supported before you go shopping for this tool. Multilingual; supports English, German, Spanish, French, Russian, Dutch etc. The biggest issue with the Ancel FX6000 is that it doesn’t cover all OBD2 vehicles. (Not many scan tools do indeed). 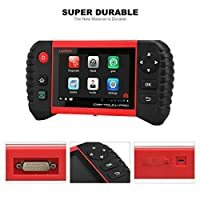 Just in case you find that it can’t communicate with your car’s computer, you could consider an alternative OBD2 scanner. The two that are comparable to the FX6000 in terms of price and functionality are Launch CRP Touch Pro and the Autel MK808. 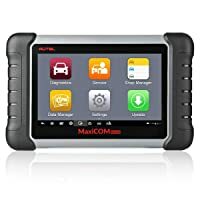 It supports full system diagnosis and full service functions with advanced functions including BMS, EPB, SAS, ABS, TPMS, Keys Programming, DPF, and Oil Reset. Cons Advanced functionalities do not work on all obd2 models. Possible compatibility issue (check carefully before buying). Doesn’t support programming or Coding Functions. 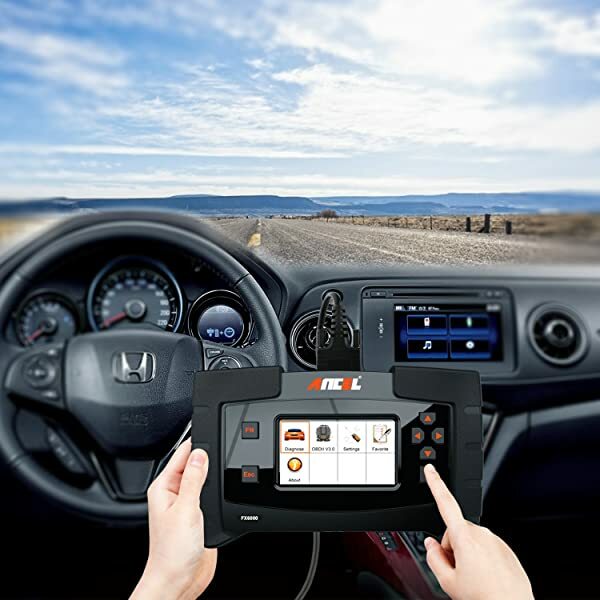 Bottom Line Professionals who want to perform complex diagnosis and fix complex issues in their car should consider ANCEL FX6000. Launch CRP Touch Pro 5.0 is for mechanics or experienced enthusiasts. Autel MK808 scan tool is ideal for professionals who want to perform advanced functions such as DPF, IMMO, ABS, SRS, TPMS etc. Who Is ANCEL FX6000 Built For? 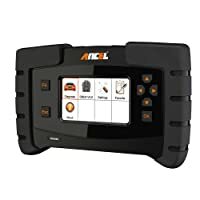 The Ancel FX6000 is obviously a very reliable scanner / key programmer / ECU programmer. If it is compatible with your vehicle then it will bring so much to the table. But is it suitable for you? Absolutely yes, if you are a car owner or DIY enthusiast. The simple menu and sufficiently elaborate user manual make it easy to use. And you get basic as well as advanced diagnostic functions. What about professional auto mechanics? It’s a bit lacking. You may like its programming and coding but they only work on selected vehicles. Plus you can’t do other essential tasks like battery service. But it makes a great complementary diagnostic tool for any auto shop. You will find that the Ancel FX6000 is not a perfect scan tool but it is ideal for a particular demographic. First, make sure it is compatible with your vehicle. And then don’t plan to use it as your primary diagnostic tool if you are a professional mechanic. Otherwise, you will be disappointed by its limited range of functions. But to car owners and DIYers, it is the perfect tool for checking and testing systems. It offers a lot more than most other scan tools of the same price range. On this page, you will find everything you need to know about your car’s EVAP system, including possible causes and solutions to an EVAP leak.